Part of the winning culture of legendary Bellevue lacrosse head coach John Baumann were his training camps at Camp Casey. That’s the reason one of his former assistant coaches brought 45 high school varsity and junior varsity players to train here this spring. 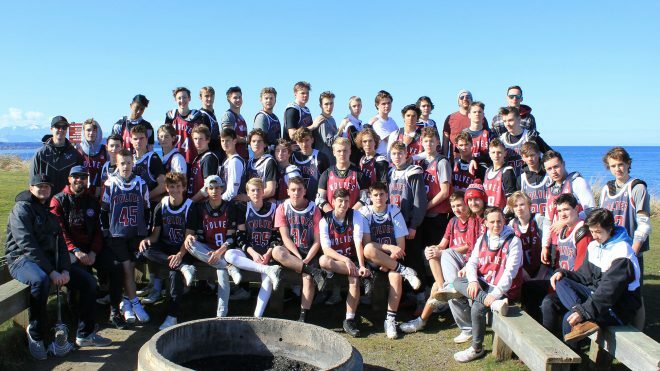 Chris O’Dougherty, head coach and program director of the K–12 Eastlake Lacrosse program in Sammamish, Washington, sees the camp as a way to help create a culture where players feel safe, yet challenged. He coaches at Eastlake High School, home of the 2018 Washington high school boys lacrosse 4A state champions. “This camp is a great opportunity for our players. We ask them to be a bit more vulnerable, without distractions,ˮsaid O’Dougherty.“It’s tough being a teenager today. It’s hard to just be yourself. We take their phones away for the weekend, and they agree to step back from social media and focus on each other. O’Dougherty had a successful college and professional career, and was captain of Team USA in the World Games. In addition to coaching at Eastside, he is co-founder of CitySideLax, which offers programs which immerse players in all aspects of lacrosse, as well as underlying principles that apply to life. Lacrosse is the fastest-growing youth sport in the U.S., predominantly on the East Coast. To learn more, visit www.eastlakelacrosse.org and www.citysidelax.com.